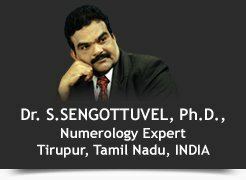 Dr.Sengottuvel's passion for Numerology can be seen in his works. But to me he's like a family member who wants your good, So I have complete trust in him. He has taken me to the next level as predicted by him. I met Dr.Sengottuvel Sir around 3 years ago when I was into my new business as things were not moving as per my calibre and expectations. My Name was adding up to a struggling Number according to Dr.Sengottuvel ji so I was asked to name alteration. A little after doing so, I signed a new projects and which became a 'Hit'! And now I have running in good profits'.I am very happy that I met Dr.Sengottuvel ji, they are best in their industry! I am greatful to Dr.Sengottuvel ji, after 'KRISHNA' became 'KRUSHNA', I started getting very popular & there is no looking back since then! "Mr Sengottuvel has been very caring about his clients and honest in his approach, with a huge command in Numerology. There is something I would want everyone to know and that is the importance of your guidance ... When I started off I was good but not good enough to be amongst the best .. Its only after meeting you and following your advise .. I have managed to make a mark in my respective field.Thank you very much for making me understand the value of numerlogy. You have changed my life. I owe you all my success! God Bless "
After meeting Sengottuvel ji, my business has grown manifolds; Man, he is terrific ! We provide the best Security but I feel secure with Mr.Sengottuvel! Thanks for all the help that you have given me when I was new, and life’s changed, thank you for adding the ‘E’ and the extra ‘A’ in my name thanks again. I was skeptical in the beginning , but disliked my old name ' Shobha' and on Mr. Sengottuvel's advise I added the extra 'A' as Shobhaa. Since then I am very comfortable and ever since, I've had a 'Song in my Lips'. I thank god that I came to you, aap ne mere naam mein kuch alphabets jode and that has really, really helped me in my profession, iss se pehle I never used to believe in these things, lekin mein jab se aap se mila, life is totally changed thank you so much. I met Sengottuvel ji first in 2007 and after taking his suggestions, my business turnover went up by a whopping 1000%!Unbelievable, but true. My family trusts his work immensely; he is more a friend and guide to us than a Numerologist. I think you are doing an extremely good thing by helping so many people, helping them with their problems, with their life’s and sorting out their problems keep up the good work, I wish you many more success. You have balanced my name and number perfectly, which has made me a positive person, all I can say is thank you very much.